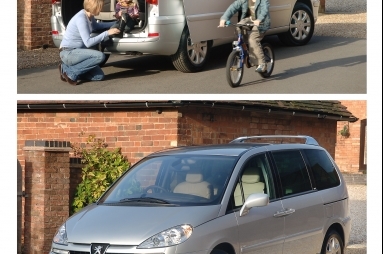 Peugeot’s versatile seven-seater 807, the first MPV to score 5 Stars in Euro NCAP, now benefits from the introduction of a new CAN (Controller Area Network) protocol, replacing the VAN (Vehicle Area Network) electronic system to improve responsiveness and provide greater functionality. This new technology was first introduced on the 407 and now features on the 307 and 607. In addition to the technical changes, the 807 range benefits from specific trim level enhancements. S models now specify 16" steel wheels (in lieu of 15") and the new Starting Grey cloth trim. SE models now feature cruise control with speed limiter, roof bars and new Fangorn Grey velour trim as standard equipment. Additional specification, over the SE, on Executive models of 807 include Alcantara® and cloth interior trim, and dark tinted rear windows. A new Euro IV compliant 2.0-litre four-cylinder petrol engine producing 143 bhp replaces the 138 bhp 2.0-litre powerunit. This smaller-capacity engine is more powerful, 5% more economical, acoustically quieter and has cleaner emissions. This performance is made possible by the fitment of a precatalyser to control and improve pollutant emissions, and a continuous phase adjustor on the inlet camshaft to improve operational performance, combine with other improvements to enhance the engine’s package. Key features: Seven-seater (no-cost option for eight), practicality, sliding rear doors, safe design and the first MPV awarded 5 Stars in the Euro NCAP tests.